Tickets for Millennium Broadway Hotel NYC New Years Eve 2020 are currently not on sale. New York is the city that never sleeps. In the center of it all, Millennium Broadway Hotel New York. Located in the heart of Times Square, guests have a front row seat to all of the endless action and constant excitement. We cater to both leisure and business travelers and is why we are preferred choice for a New York City hotel. WOW! Experience the 2nd Annual New Years Eve Gala inside the Millennium Broadway Hotel. The Millennium Broadway Times Square opens it's doors to welcome guests from all over the world to experience this amazing view of the Live Ball Drop! The countdown clock is ticking towards Midnight ... your heart is racing and you're experiencing the live ball drop from atop the 52nd Floor of the Millennium in Times Square. Perched in hotel suites, guests will have access to a one-of-a-kind view. Spanning the full floor of the hotel, you will will mix'n mingle to premium liquors, butler service, and delicious appetizers. This party includes five hours of open bar, festive party favors, and three hours of passed appetizers. A champagne toast will help you ring in the New Year! Check out our VIP package for a premium experience. Perched in hotel suites, guests will have access to a one-of-a-kind view. 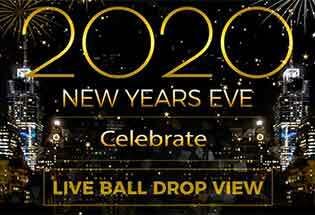 The countdown clock is ticking towards Midnight ...experience the live Ball drop from atop the 52nd Floor of the Millennium!